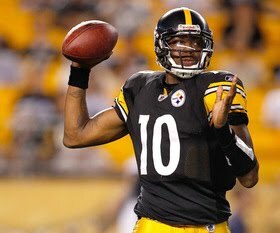 The muddled QB situation of the Pittsburgh Steelers became clear on Monday: Dennis Dixon, and not Charlie Batch, will be the starter in Week One against Atlanta. It will be the second career NFL regular season start for Dixon, who started one game, an overtime loss at Baltimore, last season. After a workmanlike performance in regulation, it was Dixon's back-breaking interception in OT that set up the game-ending Baltimore field goal. Dixon was 12-for-26 for 145 yards, 1 TD, and 1 INT, with 27 yards rushing and one touchdown on the ground, against the Ravens. In the 2010 preseason, Dixon was 23-of-32 for 327 yards, throwing 2 TD and 2 INT, with one of those interceptions returned for a touchdown. As for the 35-year-old Batch, he will start the season in his usual role as backup after getting minimal work in the preseason. Coach Mike Tomlin made the decision based in part on concerns about Batch's durability, which is certainly a valid reason after Batch's last two seasons ended with trips to IR. I'm not the world's biggest Dennis Dixon fan, for the mere reason that I don't think his run-first style translates to many victories in today's pass-happy NFL. But the Steelers are quickly running out of options at the position, and I believe that Dixon would give the team roughly the same shot at victory that Batch would, once all their respective strengths and weaknesses would be analyzed side-by-side. What Dixon lacks in polish and experience, Batch lacks in speed and agility. In either case, the other 50 non-quarterbacks on the roster must all raise their games in Ben Roethlisberger's absence if this team wants to have any shot at the postseason. I don't get all the people saying that Charlie Batch should be starting... Wasn't he a step below mediocre back in his hey-day? Don't get me wrong, i'm not excited about DD starting either, but with Large Benjammin suspended & Leftwich hurt, the steelers are gonna be hurting at QB no matter how you slice it. It's known that Charlie Batch IS/WAS a below average NFL QB. It's not yet known what DD will turn out to be. Either way, the stillers will be in a tough spot for 4 weeks, and EVERYONE else will need to step up, but i'm cautiously optimistic with DD in there (as opposed to terrified with batch in anything more than a spot start role). I'm just excited for meaningful games to be almost underway!!! I don't remember DD's pick in OT being the straw that broke the camels back against the Ravens last year. I remember the Steelers up with something like 2+ minutes on the clock and Ray Rice teaching the LB core how to play football on a 3rd and 7. That being said, I think we can go 2-2, maybe even 3-1. I agree with you. I don't get the clamor over Charlie Batch. He did some good things in spot starts but he is fragile. I believe it's pronounced "Frah-GEE-lee"